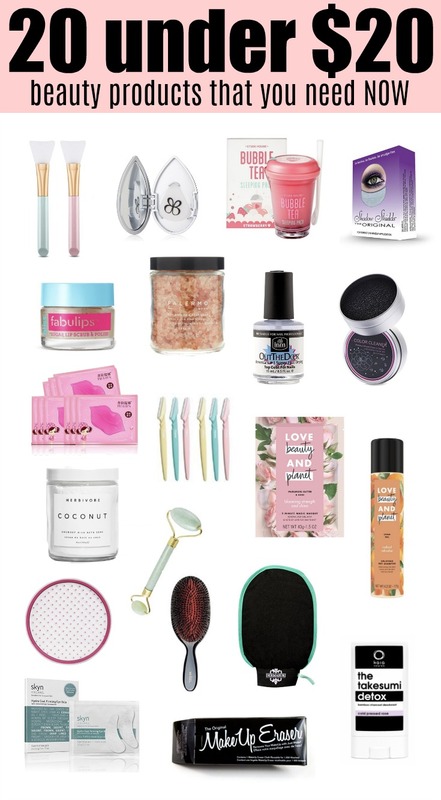 If I were to think about my entire ride or die products, these beauty products under $20 are it. These 20 products make life easier and helps this tired mama out in more ways than one. A lot of these products have been products I have stumbled upon, and or recommendations that have held up! A lot of these products are also my amazon finds. Amazon is killing it, and if you are not shopping on Amazon… then you need to get on it. Amazon Prime for life! Haha! Anyways, I hope you enjoy my ride or die beauty products under $20. Makeup Eraser– Removes smear-proof, waterproof makeup and mascara. Free of chemicals, machine washable, and each cloth will last a thousand washes! You only need to add warm water and then remove makeup. Sigmagic Scrub (use code elly10 for 10% off)- This is the only tool you need to clean your brushes! Featuring firm-hold suction cups, you’re free to wash brushes hands-free using a swirling motion, and the vented lid allows the product to dry and stay germ-free. Using 100% natural virgin coconut and ethically sourced palm oil, product build-up, oil and bacteria wash away to get your brushes back to beauty without harmful chemicals. This antimicrobial formula prevents growth of bacteria for up to 2 weeks after use. Bubble Mask– A cute bubble mask that smells so good, and helps brighten your skin while sleep! Note- I would recommend letting it dry before you actually go to sleep. Mitt Body Scrub – Made with a unique fabric texture, the mitt visibly removes surface layers of build up and dead skin instantly. Collagen Lip Mask– Collagen Lip mask softens, repairs your lips! This is by far my FAVORITE lip masks. I use these 1x a week. Cool Firming Eye Gels– Hydro cool firming eye gels work intensively to help firm, de-puff and reduce the premature wrinkling that accompanies a high-adrenaline lifestyle. Elastin helps to firm and tone, hexapeptide helps to reduce the appearance of fine lines and wrinkles, ginkgo biloba improves blood flow and helps reduce puffiness and advanced antioxidants help prevent future damage. Color Removal Sponge – This sponge is great for in between your weekly brush cleaning routine. This magic sponge will allow you to switch colors easily without the need of switching brushes. Both sides of the sponge can be used. And can be washed as well! Shadow Shields– Shadow Shields protect under eye from makeup residue and shadow fall out. It saves you on time and touch-ups as well! Do be careful, these do have a very strong adhesive, I would recommend taping them on your hand once or twice so you are not tugging on the skin around your eyes. Bliss Lip Scrub-This super-fine sugar and walnut shell lip scrub gently exfoliates and buffs away dry skin for softer, smoother lips. Phthalate-free and Sulfate-free. Love Beauty And Planet Hair Mask– Keep your hair vibrant with our Blooming Strength and Shine 2-minute Miracle Masque. Our hair mask is made with plant-based detanglers and infused with organic coconut oil. SMELLS AMAZING too. Love Beauty And Planet Dry Shampoo– Radical Refresher Uplifting Dry Shampoo instantly refreshes your hair with the energizing scent of Citrus Peel. There is no need to reapply this dry shampoo and it lasts 3 days, so far my favorite drugstore dry shampoo! Coconut Milk Bath– Deeply hydrating coconut milk is the basis of this skin softening and soothing soak. Consisting of only four natural ingredients. Leaves skin hydrated and silky soft with a light scent of natural coconut and vanilla. No animal testing is conducted on our products or ingredients. All of our oils are cold-pressed or steam distilled. Salt Soak + Dead Sea Salts – Replenishing Salt Soak is scented with intoxicating Jasmine Sumbac Absolute and balancing Geranium essential oil. Charcoal Deodorant– Ta-keh-su-mee, known as bamboo charcoal, is a time-honored Japanese secret for odor control and detoxification. With a combination of activated charcoal and natural fermentation technology which fights odor-causing bacteria. Activated charcoal has a porous surface that acts like a magnet, which chemically binds substances, such as bacteria and toxins to draw them out. Vegan and cruelty-free, 99% natural. Jade Roller– Rollers are great to have and use daily! Regular use can reduce your dark circles under the eyes and puffiness. Rollers also promote blood circulation! Eyebrow Razer– These bad boys are great to remove the peach fuzz around your face and your eyebrows! Boar Bristle Hair Brush– A boar bristle brush is great for many things, but the biggest one is it helps you maintain healthy and shiny hair. Regular brushing with a boar bristle brush will result in shinier, healthier looking and less frizzy hair. Fast Drying Polish– The only top coat you need. It’s THAT good. It’s long wearing, high gloss finish and doesn’t yellow. Face Mask Brush– These mask brushes make it easy to apply thin layers of skincare products evenly. Best suitable for facial mask, peel, serum, and other skincare products. Liner Designer Pro– An eyeliner application tool that helps you create liner looks. This triple-edged eyeliner tool provides a straight edge that will stay in place when gently pressed against the skin. The three sides are designed to help create different angles and liner shapes. Thank you so much for stopping by! Do you have any favorite beauty products under $20? Share them below!! Really amazing and useful article.Thanks for sharing this knowledgable information.